The Joint Civil Information Management Tactical Handbook is designed to provide joint procedures and standardized formats for the collection and reporting of civil data to support the Joint Force Commander planning and execution of operations. The publication consolidates the Services’ best tactics, techniques and procedures. The Joint Civil Information Management Tactical Handbook is applicable to all of the civil functional areas and sectors that comprise the civil operating environment across the full range of military operations. The handbook is non-system specific. The manual procedures and forms contained here-in are to be treated as a base-line standard. Organizations equipped with any of the several available automated collection systems may need to apply additional techniques to account for the capability of their system. The Joint Civil Information Management Tactical Handbook is intended for use by any organization with the responsibility to collect and report civil data in support of joint force planning and execution. Users include, but are not limited to tactical collectors, such as civil affairs teams, maritime civil affairs teams, civil liaison teams, provincial reconstruction teams, human terrain teams, engineers, military information support operations (MISO), maneuver forces, special operations forces, US interagency, and partner nations. The joint-CIM process standardizes actions that collectors already execute to manage civil information. Standardization enables collectors to train to the same standard and provides leaders the ability to prioritize efforts and manage expectations among stakeholders resulting in a clear vision of the civil environment for the commander. Joint-CIM is the process whereby civil information is collected, consolidated in a central information system, and shared with the supported elements, higher headquarters, other US Government and Department of Defense (DOD) Agencies, international organizations, and non-governmental organizations (NGO). Planning – The process begins with planning. Planning develops plans to collect, consolidate and share. The plan to collect considers what data and information are necessary. The plan to consolidate informs how the collected data will be organized. The plan to share identifies what to share, and with whom. Collection – This is a tested procedure that provides civil data to support the joint force commander’s civil information requirements. Consolidation – This is a tested procedure for collating and processing data to produce civil information to support planning, analysis and sharing. Analysis – This activity is situational assessment, sensemaking and projection. It supports the development of products requested by the joint force command. Production – This activity organizes, based on requirements, analyzed civil information, event logs, status trackers, etc. into products that satisfy requirements. Sharing – This is a tested procedure that supports the external and internal exchange of information to increase joint force commander and stakeholder situational awareness and situational understanding. The joint civil information management process is executed at all echelons of war (tactical through strategic). Each step of the process is emphasized differently by echelon and organization. At the tactical level, efforts are focused on collection and sharing with consolidation and analysis being a secondary effort. 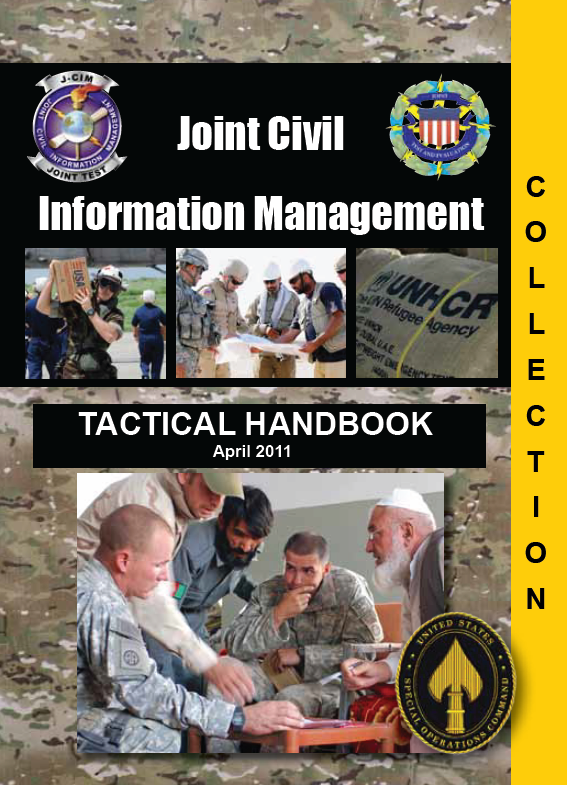 While tactical collectors do perform all six of the JCIM Process Steps, the Tactical Handbook was written to specifically address collecting and sharing of civil data. Complete, accurate, and timely collection of operationally relevant civil data is necessary for a reliable representation of the civil components of the operating environment. The ability to visualize and understand the civil components of the operating environment is a critical component of the commander’s military decision making process. Information Search: Collecting data and information from the internet, printed media, or other civilian or military sources. This collection type is viewed as indirect collection. Information search might use data mining. Civil Reconnaissance: Planned collection of focused and coordinated information by direct observation and evaluation of the operating environment. Civil Engagements: Activity to engage one or more individuals in dialogue or cultural exchange. It is a participatory interaction, such as key leader engagement (KLE), mass engagement, and surveys between the collecting unit and the indigenous populations and institutions (IPI) in the operating environment.